Instantly turn yourself into Windows repair professional. 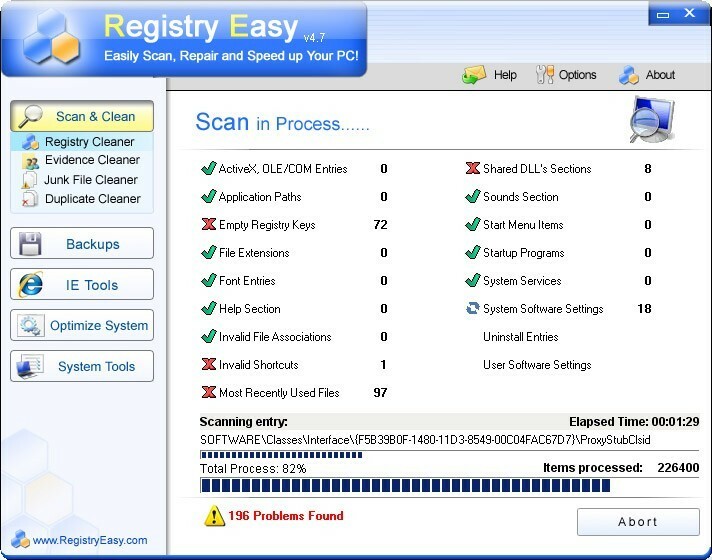 With Easy Registry Repair you will safely repair Windows registry with single mouse click!Easy Registry Repair software scans the Windows registry for obsolete or error information in the registry. When it fixes this information your PC will run faster and error free. By using registry repair tool regularly and fixing your registry, your computer will become stable and help all your software run with its optimal speed. Easy Registry Repair uses artificial intelligence detection algorithm that accurately identifies error references in your Windows registry. These errors can occur for many reasons including being left-behind after the uninstallation or incorrect removal of software, orphaned start-up programs or corrupt hardware drivers.Easy Registry Repair software repairs ActiveX, OLE/COM entries, application paths, file associations and shortcuts, shared DLLs, start-up programs and Windows services, and other 17 categories. This is complete set of Windows areas and Easy Registry Repair can repair them all.